New Orleans is truly one of the most unique cities in the United States.Â With centuries of French and Spanish rule, along with the influx of Caribbean, African, Cuban, Native American and other European cultures, this city became one of the first true melting pots of America.Â Founded in 1718, the city originally developed on the highest ground surrounded by a crescent shaped bend of the Mississippi River.Â This original establishment is what we know call â€œThe French Quarter.â€Â Here you can stroll freely through the charming historic neighborhoods and admire the 18th and 19th century colonial European architecture, visit the many antique shops and the tiny museums, or catch a historic street car to other interesting parts of town.Â The local people of New Orleans are very friendly and display Louisiana-style southern hospitality and manners most of us do not regularly encounter. Visitor to New Orleans tend to stay in or around the old French Quarter.Â Here along the famous Bourbon Street you will find a large number of cafes, bars and nightclubs playing some of the best live Blues and Jazz, as well as Rock and R&B music around.Â Youâ€™ll find plenty of drinking, promiscuous activity, street performers, and an around the clock party scene. Â Many clubs and bars have no set closing time, and drinking in public and open-containers along Bourbon Street and much of the French Quarter is accepted.Â There is always cause for celebration.Â Aside from the world famous Mardi Gras Festival, the city hosts a huge annual Jazz & Blues Festival, as well as many smaller festivals throughout the year.Â Just pick any holiday like Halloween, St. Patrickâ€™s Day, and itâ€™s an excuse to have a big party.Â Even a funeral will parade around the French Quarter playing Jazz music and singing like itâ€™s a celebration. 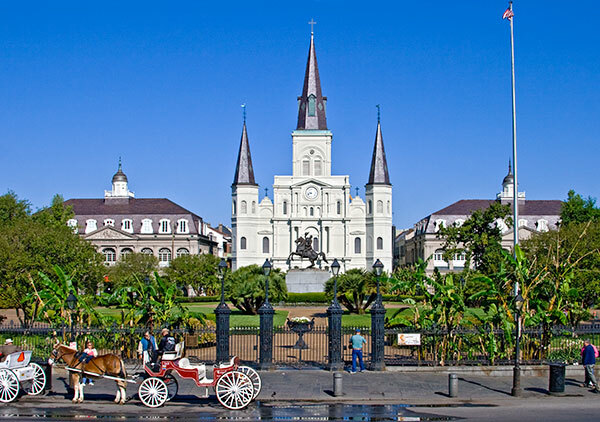 Aside from the nightlife, be sure to take an enjoyable walking tour of the French Quarter or the beautiful nearby Garden District, which is full of antique stores and shops along Magazine Street.Â The focal point of the French Quarter is the beautiful Jackson Square and itâ€™s historic St. Louis Cathedral that was founded in the early 1700â€™s.Â History buffs will enjoy a visit to the Chalmette Battlefield, the National World War II Museum, or even one of the famous New Orleans style cemeteries.Â Visitor often stop at some of the little quirky museums like the Backstreet Cultural Museum or the Historic Voodoo Museum featuring a collection of artifacts from the Voodoo Queen and examples of Voodoo beliefs.Â Taking a riverboat down the Mississippi is a picturesque and relaxing way to spend some time. Two of the cultures unique to New Orleans, and particularly unique to New Orleans cuisine, are Cajun and Creole.Â People you meet may say â€œIâ€™m Cajunâ€ or Iâ€™m Creole.â€Â They are proud of that heritage.Â Most New Orleans outsiders canâ€™t tell them apart.Â Cajuns originated from 17th century French colonial Nova Scotia, Canada.Â When the British claimed it as a territory many of the settlers fled to the Caribbean before finally establishing roots in the French colonial city of New Orleans.Â They Speak Cajun French and have their own style of food and customs.Â Creoles on the other hand, are descendents of the Caribbean regionâ€™s French colonies, and speak Creole French.Â Neither of the two languages is French and both cultures are heavily influenced by Caribbean traditions.Â Either way, both cuisines are spectacular blends of Caribbean and European cooking traditions. Â On the music scene, todayâ€™s Jazz was derived from a Creole Music style, while Zydeco music was derived from the Cajun culture. In the local restaurants youâ€™ll find some of the most sinfully good food, rich with butter, cream, oil, and heaping with calories, but delicious and irresistible.Â Just forget about your diet while you are here and enjoy it.Â You can try all the local New Orleans dishes like Gumbo, Jambalaya, Red Beans and Rice, Po-boy Subs, Pecan Pie and the famous Beignets. Â There are also many traditional French restaurants and other popular cuisines to be found here.Â Super popular restaurants around town include: CafÃ© Du Monde (famous for its beignets and chicory coffee); GW Fins; Commanderâ€™s Palace; Brennanâ€™s; Arnaudâ€™s; Court of Two Sisters; and, celebrity chef’ Emeril Lagasseâ€™s Emerilâ€™s.Â You really have to search hard to find a bad restaurant, so there are so many good restaurants to choose from. Many of the hotels in the French Quarter are old, funky, small, and charge a lot of money, particularly during major events.Â Rates are cheaper in the summer months when New Orleans is hot and muggy; itâ€™s the low tourist season.Â There are super nice hotels within walking distance of the French Quarter.Â VoyageMonkey recommends the following 5-Star and 4-Star hotels in French Quarter area: If you must stay in the heart of the French Quarter, the Royal Sonesta New Orleans at 300 Bourbon St. is in the center of it all, has a pool, restaurant, health & fitness club, room service, and is the best in the heart of the French Quarter;Â Le Pavillon Hotel is conveniently four blocks from the French Quarter, also has a pool, restaurant, health & fitness club, room service, and fantastic amenities;Â The Ritz-Carlton New Orleans is just one block from bourbon St. at Canal St., making it a great location for transportation access, walking, and is full of 5-Star amenities like 24-hour room service, bar, lounge, restaurant, pool, steam room, sauna, spa, and more.Â Also, nearby hotels we recommend include the Roosevelt Waldorf-Astoria, Harrahâ€™s Casino Resort, and the W Hotel. Since cruise ships depart from New Orleans you can take a Caribbean cruise and add a few nights before or after your sailing.Â Be sure to check out VoyageMonkey.com for regular travel deals on hotel accommodations and airline tickets. This entry was posted on Friday, October 5th, 2012 at 10:52 am	and is filed under Travel. You can follow any responses to this entry through the RSS 2.0 feed. You can leave a response, or trackback from your own site.